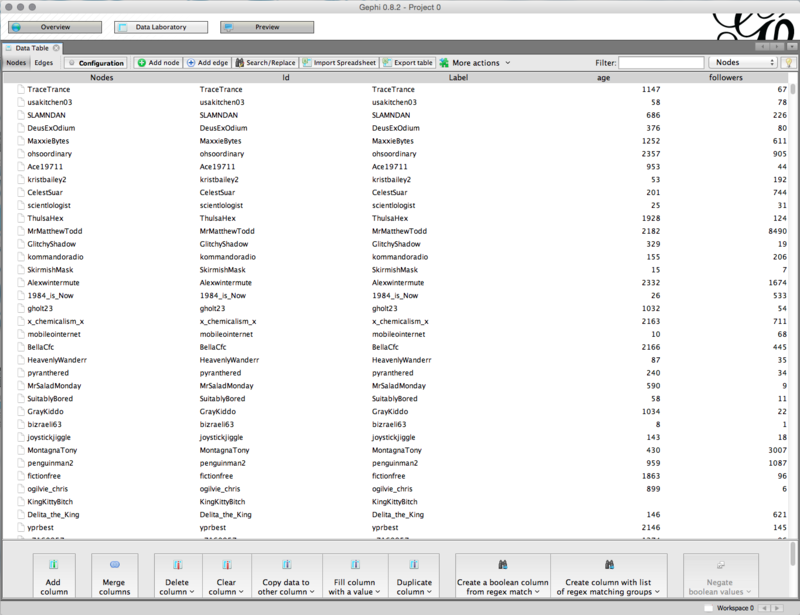 In the previous posting, I went over how to connect to Twitter’s streaming API using a connector app and the Tweepy Python library, as well as a quick overview of how to construct a Pandas dataframe from the tweets we’ve collected. 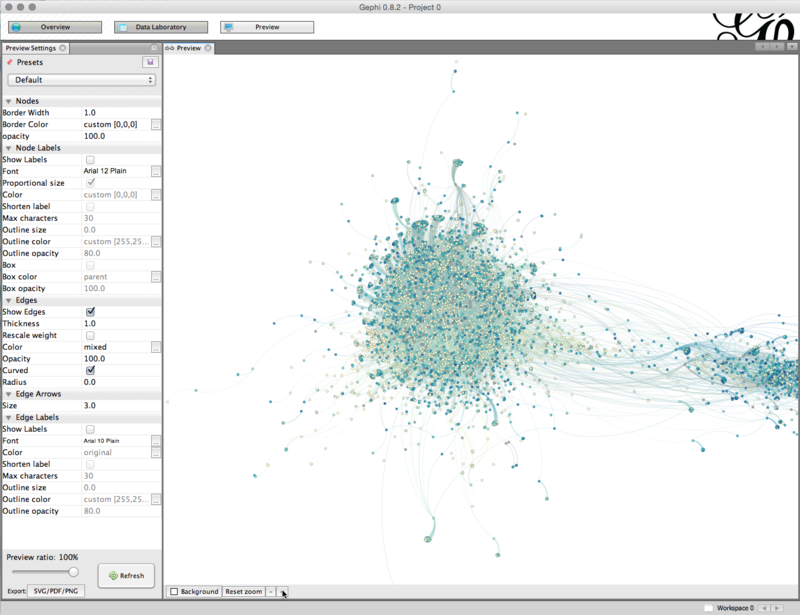 In this posting, we’ll extract all of the information we’ll need to use NetworkX to create a directed graph that we can visualize in Gephi of who’s retweeting whom, keeping track of the age in days and the number of followers that each user has so we can filter on those factors if we like. 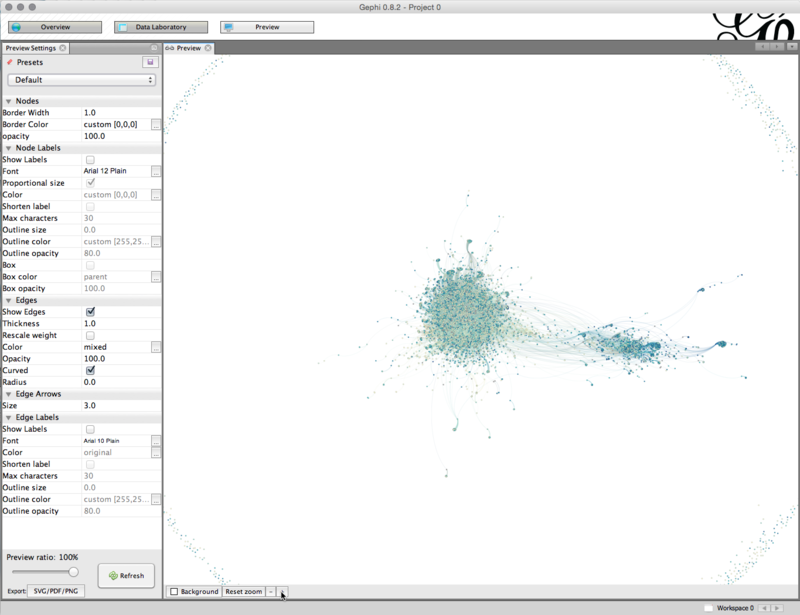 First, if you don’t have NetworkX, install it with pip, and download and install Gephi. Again, we’ll assume that our tweets are collected in a text file, “gamergate.txt”. 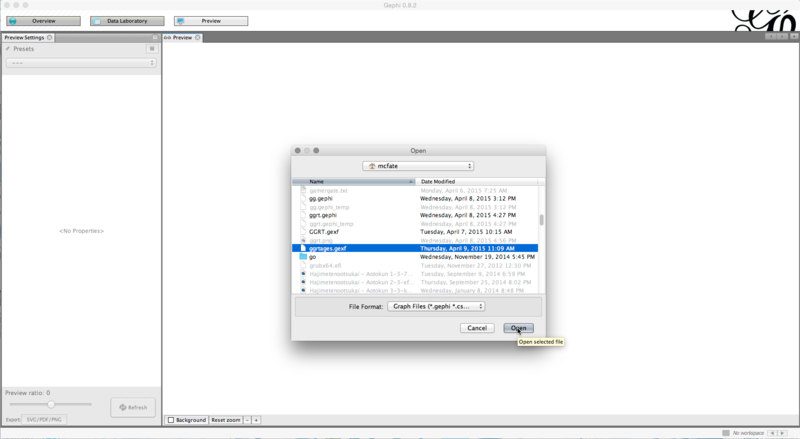 Let’s pull the data out of the text file into a new data frame. # Clean out limit messages, etc. Here’s a script that will iterate through the dataframe, row by row, and construct a directed graph of who’s retweeting whom. Each directed edge represented the relationship “is retweeted by”, the higher the weight of an edge, the more person B is getting retweeted by person A. 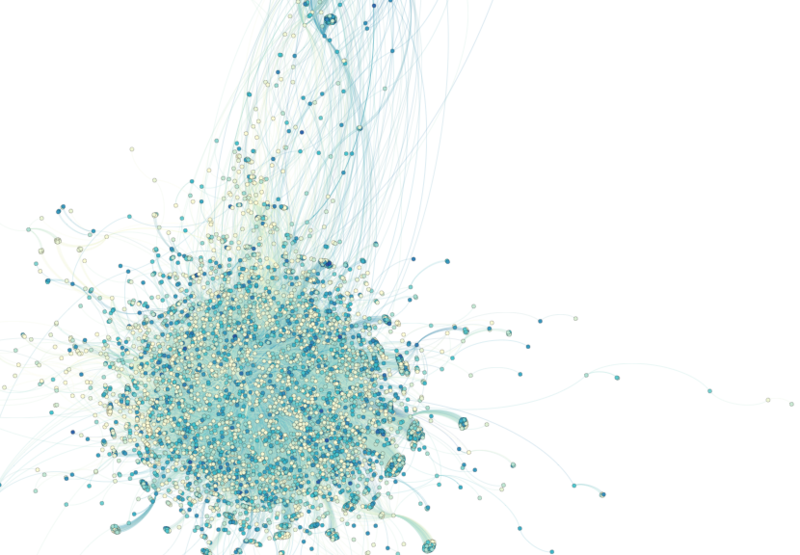 Each node represents an individual ID on Twitter, and has attributes to track the number of followers and the age of the ID in days. # Is the sender of this tweet in our network? # If this is a retweet, is the original author a node? # If this is a retweet, add an edge between the two nodes. 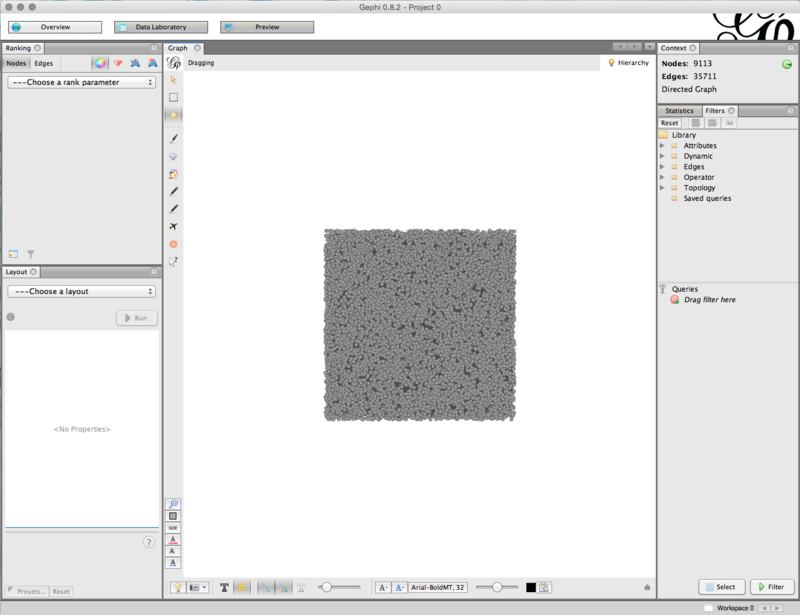 The last thing we did was to save out a GEFX file we can then read into Gephi. Start Gephi up, and open our file; we called ours “ggrtages.gexf”. 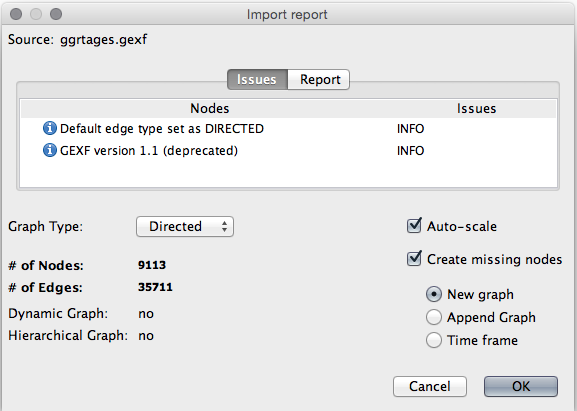 You’ll get a dialog telling you how many nodes and edges there are in the graph, whether it’s directed or not, and other information, warnings, etc. Click “OK”. Gephi will import the GEFX file. You can now look at the information it contains by clicking on the “Data Laboratory” button at the top. Click on the “Overview” button to start working with the network. 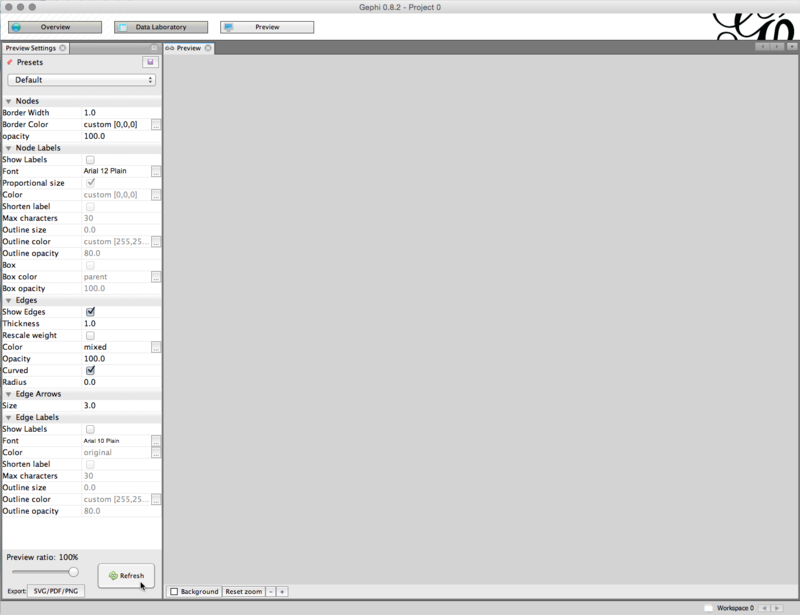 At first, it doesn’t look like anything, since we haven’t actually run a visualization on it. Before we do, we can use some of the node attributes to color nodes a darker blue based on their age. We can use the “Ranking” settings to color our nodes. Click on the “Select attribute” popup, and choose “age”. You can choose difference color schemes, change the spline curve used to apply color, etc., from here as well. Click on the “Apply” button to apply the ranking to the network. The nodes will now be colored rather than gray. 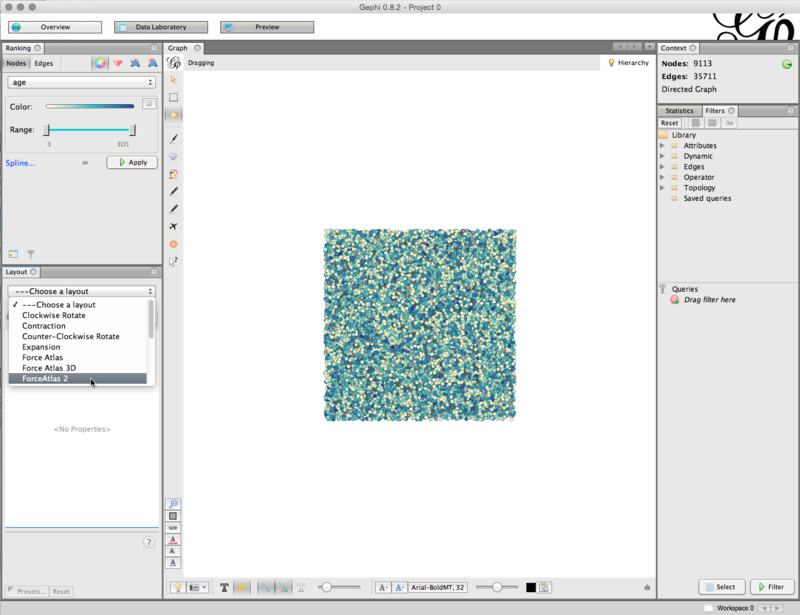 Now, we’re ready to run a visualization on our data. 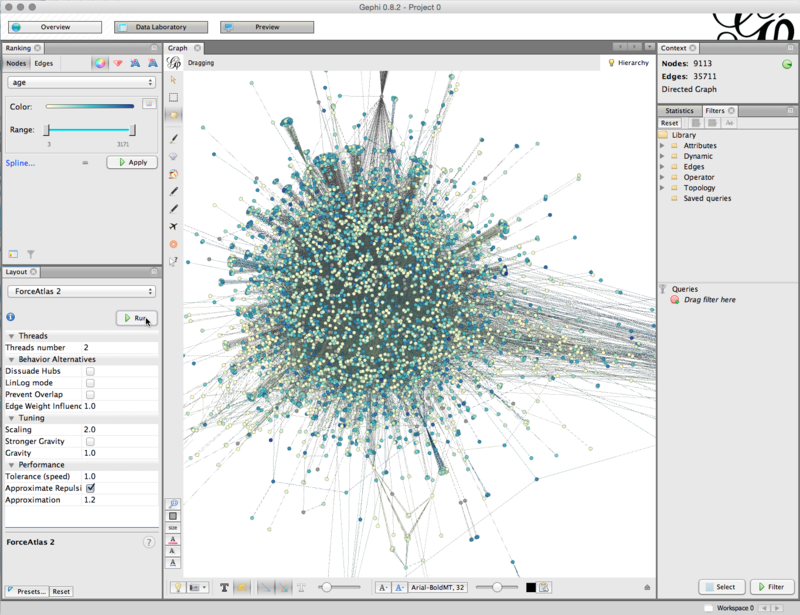 From the “Layout” section, let’s choose “ForceAtlas 2″—it’s fast and good at showing relationships in a network. Press the “Run” button, and let it go for a bit. 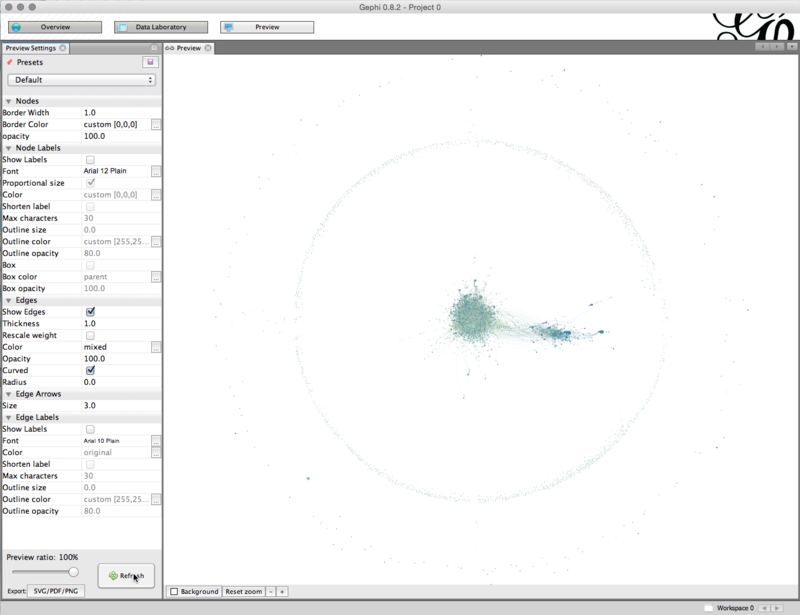 A network this size—about 10K nodes and 30K edges—settled down on my MacBook Pro within five minutes or less. When you feel it’s stabilized into something interesting, press the “Stop” button, and then click on the “Preview” button at the top. The preview panel won’t show anything at first. Click the “Refresh” button. Gephi will render your visualization. You can use the mouse to drag it around, and you can zoom in and out with a scroll-wheel or with the “+” and “-” buttons below.